To mark the 4oth anniversary of the Booker Prize, a panel of judges was asked to select a shortlist of the best books to have won the prize in the previous four decades. For the first time the overall winner will be selected by a public vote. As part of the London Literature Festival, a panel champion the novel they think should win from the shortlist, followed by a vote from the audience prior to the announcement of the public vote on Thursday. The festival is vibrant, busy and fun. 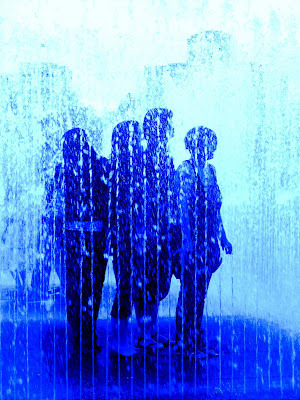 People play in the water sculpture, eat ice-cream and drink as staff dressed in black flit amongst them dropping books from the Best of the Booker. Festival deckchairs litter the site bringing a feeling of summer to the riverside. At the event the panel read extracts. Claire Armitstead, the literary editor of the Guardian, reads chapter thirty-three from Peter Carey's Oscar & Lucinda . It's been twenty years since she last read it and she has clearly enjoyed coming back to an old friend. Peter Kemp, the fiction editor of The Sunday Times and a Booker judge in 1995, reads from Pat Barker's The Ghost Road and describes it as "a triumph of imagination and intelligence." Writer, Lesley Lokko, reads the very last pages from the 1994 winner The Conservationist by Nadine Gordimer and defends a difficult book that "inhabits the tricky place between art and life." 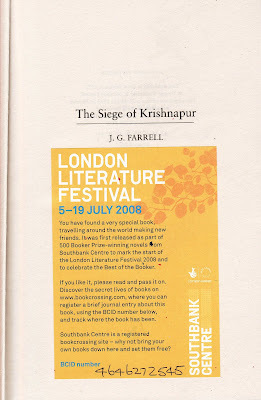 Edna O'Brien, an author who was on the 1973 panel of The Booker, reads a page and a half from JG Farrell's The Seige of Krishnapur. She recounts how she was asked in 1973, "She has changed her mind. Do you wish to change your mind?" when her fellow judge, Mary McCarthy, changed her mind after agreeing to Farrell and wanted Iris Murdock's The Black Prince to win. The author, Kamila Shamsie, speaks passionately on Salmon Rushdie's Midnight's Children which won the Best of the Booker when it was 25 years-old and describes a feeling of joyfulness that comes from reading the book. Mark Thwaite, from Ready Steady Book, champions JM Coetzee's Disgrace once, that is, he has humorously lambasted the other shortlisted books. Mark himself is interesting, funny yet strangely dry in his delivery. After, we all vote and questions are taken from the audience. Some of the panel admit they can't understand why other past winners didn't make the final shortlist and some, like Peter Kemp and Mark Thwaite, say they would have chosen different past winners to champion. The winner is announced. Salmon Rushdie with 47 votes for Midnight's Children. In the end this is somewhat of an anticlimax and the panel and audience quickly disperses. But perhaps in the end, like in a good book, the joy was in treading the path rather than in the end itself. 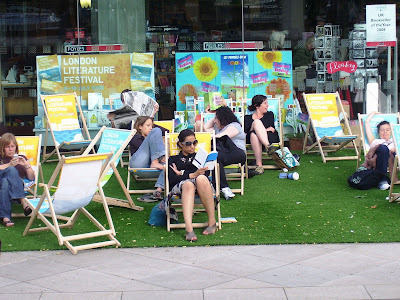 The London Festival runs until July 19th. For details click here. Top picture : Appearing Rooms Fountain at the festival. Middle : One of the hundreds of books dropped around the site. Thanks for this! Glad you made the event and that you enjoyed it. You say, "Mark himself is ... strangely dry in his delivery." I was! I was very nervous!! But, nerves aside, I had a great evening: it was a fun event, even if the concept of Best Bookser is a wee bit daft! I agree, it is all a bit daft, but a good chance to talk about books which is never a bad thing! Yep the "dry" comment was because I was expecting you to shine above the others in terms of delivery but you seemed to be reading directly from notes with little eye contact. I would have loved to see you rip them up and bring an emotional passion to it that you gave us glimpses of at other times. Well done for championing the "blogosphere" as a great place to discuss books even if, as you said, the term itself is dreadful! You are absolutely right Mike. I felt hampered by my own notes. I kept telling myself to look up, but somehow couldn't. If I had just left my notes on my seat and done my usual stand-up routine it would have been much better. Oh well, I'm pretty new to this. You live and learn!! Sometimes the best writers are bad speakers. My husband once explained to his boss that business writers can be shy. The woman could scarcely grasp the concept: SHY! He then explained, using himself as an example, that he wrote much better than he spoke. Writing felt more natural. Speaking at The Best of the Booker Prize @ The London Literature Festival, of course, is speaking as performance--a whole other feat in another realm. Then, too, a dry performance in rainy climate might be desirable. Was the Lone Ranger in evidence? Indeed I was Kathleen! Who do you think nabbed the book in Mike's report! You lucky duck. I'm trying to control my envy.